It goes by a number of names - 'hydraulic fracturing', 'shale gas extraction', 'hydrofracturing' or 'hydrofracking. Not to forget the name beloved of headline writers around the world - 'fracking'. But what exactly is fracking, and why has it become such an environmental hot potato? Is it helping to save the world, or condemning it to climate chaos - or is it just perhaps a scam, stoking up a fossil-fuel financial bubble? Hydraulic fracturing is the name given to a way of squeezing gas and oil out of tight rock reservoirs, places where these hydrocarbons just won't flow out naturally. So far, most of the oil and natural gas man has extracted, comes out of the ground on its own accord - so called conventional plays. It gets pooled in deeply-buried reservoirs - sponge-like rocks where it has been trapped, unable to move any further. Down there it is also under a lot pressure. Simply drill a well into these conventional reservoir rocks, and that pressure drives out the fossil fuels, into the well and so up to surface - such wells are understandably called 'gushers'. But there are plenty of rocks that are hold onto their gas (and occasionally oil) in tiny fractures, rather than larger pores. These 'unconventional' reservoirs are usually mudstones, buried and compressed into a hard rock that geologists call shale. Drill a well into them, and nothing happens - the shale gas is locked up too tightly. Which is where hydraulic fracturing comes in. The idea is to put the rocks under enough pressure that the tiny natural fractures are opened up - and new ones formed - so that the gas comes flooding out. The pressure to open such fractures is provided by pumping water, mixed up with various additive compounds, down into injection wells. Once the shales have been opened up, or 'fracked', the wells switch from injecting to extracting the gas released. Although the controversy with fracking, and shale gas, is new, the technology is quite old. It was first developed by well engineers after the Second World War - it helped to get to more hydrocarbons out from some reservoirs, even using the vertical wells that companies drilled at the time. What has changed over the last decade is that new drilling technology allows long horizontal wells to be drilled, for miles along the rock layer. That and the fact that energy prices have shot through the roof. Horizontal wells mean that long lengths of the reservoir can be bought into production - so massively increasing the volume and rates of gas or oil that can be gotten out through fracking. And the fact that hydrocarbon prices have rocketed - and that gas has come to be seen, by some, as an attractive 'bridge fuel' in the transition to green energy - has meant that shale gas extraction has boomed of late. That's particularly true in the US. Large areas of the country are underlain by thick shale deposits, including the Texas Barnett shale formation, and the Marcellus Shales stretching under New York, Pennsylvania and West Virginia. 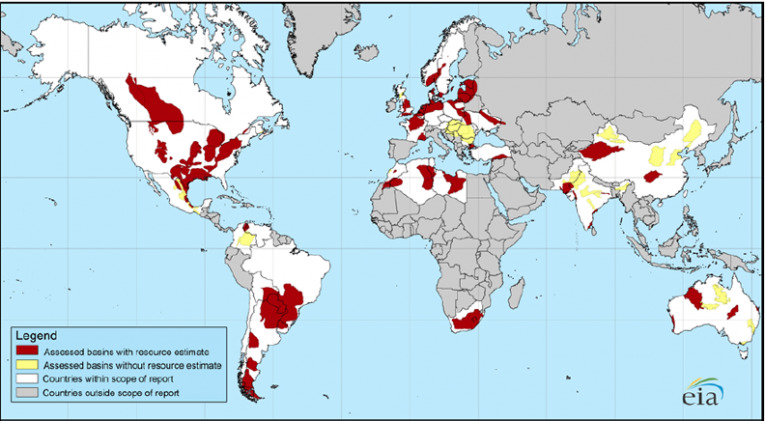 An outbreak of shale gas fever has pockmarked swathes of these areas with thousands of wells - and boosted shale gas production from 0.4 trillion cubic feet in 2000, to nearly 5 trillion cubic feet, just 9 years later. But whilst gas companies have eyed plentiful new resources, which have ballooned to 860 trillion cubic feet in the US - and over 6,000 trillion cubic feet worldwide - many living near to hydraulic fracking wells have simultaneously watched their water quality plummet. The number of environmental problems for locals has multiplied worryingly, pushing the United States' EPA into conducting a thorough review of the whole industry. Problems reported include flaming tap-water, due to methane contamination; leaks of fracking fluids into water-wells and aquifers; chemically-contaminated waste water spills into rivers; and even earthquakes. Fracking operations also use vast quantities of water - so worries about the drawing down of scarce water resources have been expressed in place like Texas. These local problems are magnified by more global concerns - shale gas has been marketed as a relatively clean fuel, because the CO2 emissions from burning it are so much lower, than for fossil fuels like coal and petroleum. Many gas companies have put forward shale gas a clean 'bridge fuel', to help ease the move to a wind- and sun-powered future. 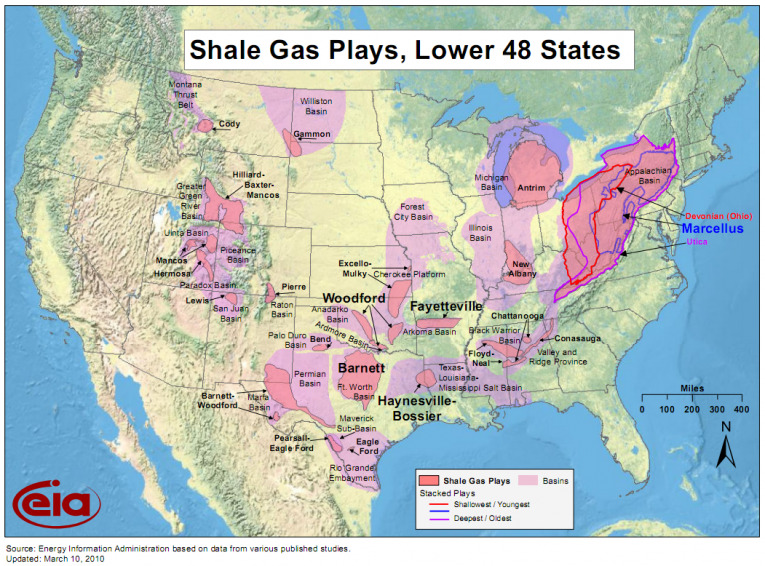 The problem is that gas is leaky - and shale gas may be doubly so. That matters because shale gas is mainly methane, a potent greenhouse gas. From the time the well is drilled, methane is leaking into nearby rocks, and escaping to the surface; not all of it is captured at the well head. And gas pipes, taking the shale gas from wellhead to homes, are notoriously prone to escapes. That may put the carbon footprint of shale gas on a par with dirty coal. Finally there are concerns over whether the whole 'shale gas revolution' has been blown out of proportion - with the gas industry exaggerating the potential to attract investors. Many wells fail to produce anything, and even the best wells show a dramatic decline after a year, requiring more and more wells to be drilled. Because shale gas is more expensive than conventional gas to produce, a collapse in gas prices could eventually prick the shale gas boom. So poor economic fundamentals could come to the rescue of worried residents, and a warming planet, well before the regulators decide on how best to handle fracking, and the shale gas explosion.